At around 8:00 am, we saw ourselves riding in tandem again on a motorcycle, off to the port where a pumpboat awaits us for our island hopping activities. The boat is smaller than what I imagined (my benchmark being the boat in Honda Bay in Puerto Princesa or in Coron). But, the boat, I tell you, is small but terrible. The regular rate for one-day island hopping at Islas de Gigantes is Php 2,500 for a boat that fits 10 people if you're coming from Gigantes Norte. You may contact Joel Decano at 09184685006. Early on, Joefer Decano (Joel's brother who served as our tour guide) said that we might not be able to go to Uaydahon Island (a very nice snorkeling site) and Tangke saltwater lagoon because of the humongous waves roaring at the Visayan sea that time. We said it is OK to skip Uaydahon but begged to at least try to go to Tangke, as it is the most iconic site in Islas de Gigantes. So, upon consulting with the two other boatmen - Marni and Taboy - they said yes! After the failed attempt to go inside the saltwater lagoon, we cruised the waves to our next destination - Cabugao Gamay Island. There are actually two "Cabugao" islands in Islas de Gigantes: Cabugao Gamay (gamay means 'small') and Cabugao Dako (dako means 'big'). We went to Cabugao Gamay as Joefer had suggested. "Cabugao" means pomelo or suha in the vernacular. It is named as such as there are a lot of pomelo trees within the island, though we haven't seen one. The sand is white but not fine, but the island's shape is an eye candy! If you have been to Bantayan in Cebu or Buntod Reef in Masbate, the sand there is similar to the one in Cabugao Gamay. Perhaps the reason behind is it's location. Masbate lies at the northeast of Islas de Gigantes, while Cebu (Bantayan in particular) lies on its southeast. Cabugao Gamay has rows of coconut trees and sharp limestone cliffs on both sides. Make sure to wear your aqua shoes or flipflops because there are sharp shells (yes, you guessed it right, there are also scallop shells here!) on the sandbar. You can also go snorkeling here, but we were told that the corals and fishes here are less than in our upcoming destination - Antonia Beach. The sand gets finer as you go farther into the sea. But you have to be careful as the current tends to get really strong, so be vigilant and wear your life vests always. The water in Islas de Gigantes is so clear and blue. We could just imagine how nice it is to look at during summer when the sun strikes at the white sand and bounces off the clear waters. The rocks at Cabugao Gamay are comparable to the ones in Coron. I remember seeing a rock formation like this at the far end of Malcapuya Island in Coron. The island is so serene. I can imagine the hit reality TV series Survivor doing their shoot here. Islas de Gigantes is like Caramoan in the earlier years. Hmm, I'd love the idea but on the contrary, I'd love my fellow Filipinos to enjoy the beauty of Islas de Gigantes first, bago pag-pyestahan ng mga banyaga. I intended to write that in the vernacular. 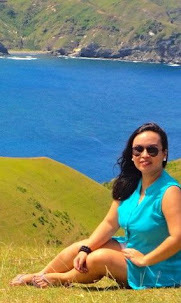 A visit to Cabugao Gamay is not complete without the iconic photo ops atop the rocks. And to do that, you'll have to climb the rocks, get dirty, and never look back. LOL. Make sure to wear non-skid footwear or flipflops and put your camera on a strap as the rocks are a bit steep and challenging. But, as Joefer said, if you go caving in Islas de Gigantes, this one is just like a warm up. Though I am afraid of heights, my friends and Joefer gave me a hand and in no time I saw myself on top of the rocks with this panoramic view in front of me! Thanks, friends! After taking some photos and having a quick dip, we continued our journey and went to Bantigue Sandbar. It is just across Cabugao Gamay so in about 10 minutes, our boatmen anchored our boat to the long stretch of sand. The sand here is finer, but a bit yellowish in color. The comparison I could think of is that of Misibis Bay in Cagraray Island, Albay. At the far end of the island are about four to five houses inhabited by the locals. from Bantigue Sandbar, you can see Cabugao Gamay. This can be a perfect backdrop for the much-anticipated jump shot! Do the jump shot here! Our next destination is Antonia Beach where we stayed longer for lunch, snorkeling and beach bumming. I will do a separate post on Antonia Beach next, so stay tuned. At Antonia Beach, we saw another boat of tourists docking and overheard their conversation that they had just came from Tangke. And so we begged Joefer, Marni and Taboy again to bring us to the saltwater lagoon, as we believe that a trip to Islas de Gigantes isn't complete without seeing this natural wonder. So, excited to go back to Tangke, we packed our stuff and boarded the boat again. When we approached the limestone entrance, the waves were still roaring, but not as strong as the morning earlier. Our knights in shining armor - Marni, Taboy and Joefer - did their best to anchor the boat to the huge rock. It wasn't as easy as we thought. Marni had to dive again and tie a long rope around the rock so that our boat will be sturdy. Joefer tried to put the wood that will serve as our ladder in between the boat and the limestone but again, to no avail, he failed. So, they tied the boat with more rope, Joefer was able to cross the limestone cliff, while Marni and Taboy held a bamboo which will serve as a handle where we can hold on to while we cross from the moving tip of the boat to where Joefer was. My friends went in first. It wasn't easy as you have to have a perfect timing as to when to step from the tip of the boat to the rock. I decided I wouldn't go. I can't. I am not good in balancing. I might just end up hitting my head on the sharp rocks. But then my friends never gave up and persuaded me to try anyway. Again, it wasn't easy. The waves made the tip of the boat move farther away from the bamboo where I held on to. I screamed my lungs out, and the next thing I knew, I was stepping on the rock where my friends are. Wheeeewwwww! Again, thank you friends! Without further ado, here's where we're dying to go to - Tangke Saltwater Lagoon. The lagoon is the best I've seen so far. Clear waters, amazing rock formation and serene atmosphere. Enchanting, indeed. When I first saw it, I can't help but say "Oh my god, ang ganda!" while my heart was still beating fast from the stunt I made in order to get inside the lagoon. When we were still researching about Islas de Gigantes, we had read some accounts that says Tangke saltwater lagoon is enchanted. One proof is that you won't see any leaf on its crystalline waters, something that is unusual as the lagoon is surrounded by cliffs that has a lot of trees ( and monkeys). Some believes that a goddess has been protecting the lagoon. However, Joel Decano shared a scientific explanation as to why there is no single leaf in Tangke. He said the water at the lagoon rises at high tide, and when the water gets low at low tide, all the trash including the leaves are somewhat being suctioned into the sea. Quite hard to believe but still makes sense. Aside from shouting in excitement, the next words I said inside the lagoon was "dapat may photo ako dito!" And so, Joefer got our cameras and we had our photo ops. If you have a waterproof camera, better to bring that inside the lagoon than an ordinary camera because on your way out, you'll have to go through a small hole in the water. Sort of like the one in El Nido but a bit higher. There goes another buwis-buhay stunt for me, because as you get out of the hole, you'll have to swim to the boat while the waves are getting in your face as if bidding you goodbye. Though we were so exhausted with climbing up and down, battling the waves and braving the challenging entrance of the saltwater lagoon, we still went home with big smiles on our faces. Islas de Gigantes is amazing. It is not your typical frou frou beach where you just flaunt your bikini and sip a margarita by the shore. 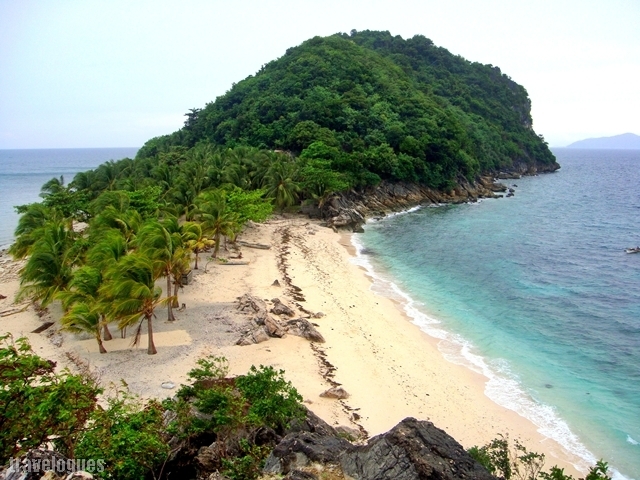 If your dream is to be a part of Survivor, then Islas de Gigantes is for you. It's definitely worth the long travel time from Iloilo. Where to stay at Islas de Gigantes?